Mullingar’s Derek McGee will use the Easter meetings at Bishopscourt and Kirkistown as an opportunity to put more miles on Wilson Craig’s machines before the KDM Hire Cookstown 100 later this month. The quiet Irishman is among the entries at the Enkalon meeting in Co Down on Saturday, where McGee will ride Craig’s Hondas as part of his early season preparations. McGee, who was crowned Irish Supersport champion on the roads last year, is gearing up for the biggest season of his career to date and will make his debut at the North West 200 and Isle of Man TT in addition to contesting a full season at the Irish national meetings and the Ulster Grand Prix at Dundrod in August. 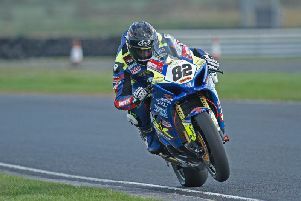 Team owner Craig told the News Letter: “We had a test at Kirkistown on Tuesday and Derek managed about 50 laps on the 600 and was very happy with the bike. Having said that, we only managed five or six laps at a time because the weather was hit and miss all day and we had rain, hail and high winds. “But we were satisfied with the work we did with the 600. Then we switched to the big bike but the engine was brand new and we needed to do 50 miles to get it bedded in. “Derek managed to get the engine run in but the highest revs he was at was about 10,000rpm on the straight, so he didn’t really get to see what the bike could do, but it was important to get the engine bedded in,” Craig added. “We had intended to go out on the track again around 5pm but we had another big shower and at that stage we decided to put the bike in the back of the van. The Enkalon Trophy meeting, which is backed by Adelaide Motorcycle Insurance, is being held for the 39th time and includes entries from William Dunlop on the CD Racing Yamaha plus Derek Sheils and Scotsman Keith Amor. Amor is returning to the Superbike class this year on the roads on a BMW S1000RR with backing from Rig Deluge and along with Sheils, both former winners of the Enkalon Trophy, lines up among the favourites. Short circuit frontrunners Gerard Kinghan, Mark Glasgow and Alistair Kirk are also entered along with Stephen Thompson, who hopes to make his race debut with new team Penz13.com on a BMW S1000RR. Both Superbike races will count towards the Enkalon Trophy, with the rider accumulating the most points lifting the title plus a £500 top prize. A total of 16 races are scheduled, with the first race due off at approximately 11am. Practice takes place from 9am and admission is £10, including a race programme (U16s free with an adult).